Lacrosse stick: Each player must have his own lacrosse stick. There are many varieties to choose from, and any reputable store specializing in lacrosse can recommend a suitable stick, given a player's age, size, and experience. More experienced players who wish to specialize in certain positions may purchase sticks specially tailored for that position. The most important of these are the defender's "longstick" and the goalie's stick. The beginner, however, should simply buy a generic stick of the standard length. 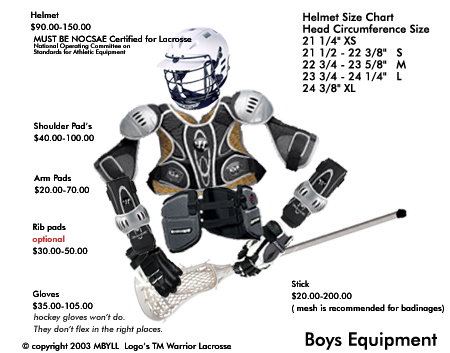 Helmet: Each player must have a lacrosse helmet. Helmets must be official, NOCSAE certified, lacrosse helmets (ice hockey helmets are no longer allowed). Mouth guard: Every player must have a mouth guard. These are inexpensive, but be sure to get one that has a leash that can be attached to the helmet.